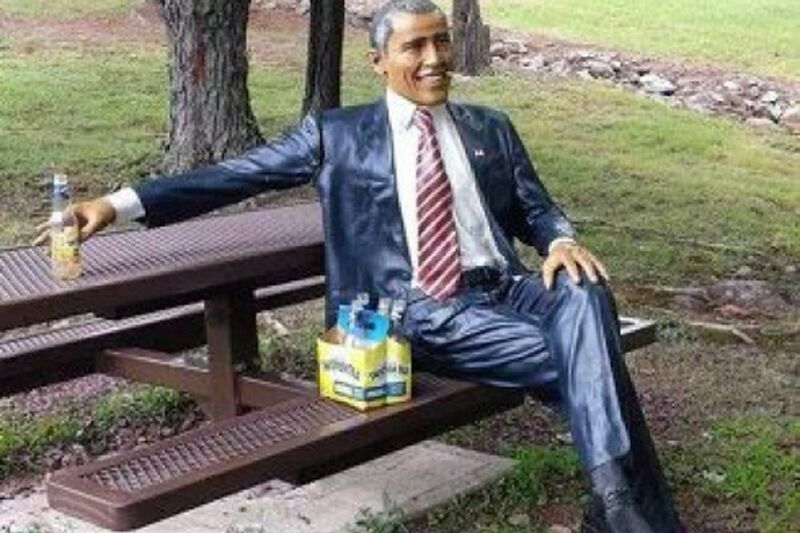 A $1,200 LIFE-SIZE statue of President Obama has been returned to a Wilkes-Barre woman after it was found on a park bench posed with a six pack of Twisted Teas. Tiffany Bruce, 30, told the Daily News yesterday that the statue was stolen off her porch early Sunday. It was recovered five days later after a police detective saw a picture posted on Facebook of the statue, lounging at a picnic table at Francis Walter Dam with his right arm outstretched, holding a bottle. The statue became beloved by the family after Bruce bought it last year at a furniture store. She and her five kids dressed the statue up for Halloween, arranged pumpkins around it on Thanksgiving and decorated it as Santa Claus on Christmas. Bruce said she has been saving up for more statues. "I tried to order Hillary [Clinton] five months ago," Bruce said. "Hopefully I'll get Michelle [Obama]. I'm just getting one at a time because they're expensive." Bruce said that since the news of the theft broke, she's been getting harassed by people on Facebook who say she's wasting money. "People say it's OK to spend $300, $400 on Jordan sneakers, or on alcohol, but it's not OK to spend that on something that honors the president?" she said. "I don't care what other people say. It's my money." "I'm just glad he's in one piece."